When we say “The Budget,” we are speaking about the $2.16 billion operating budget that keeps our University running each year. 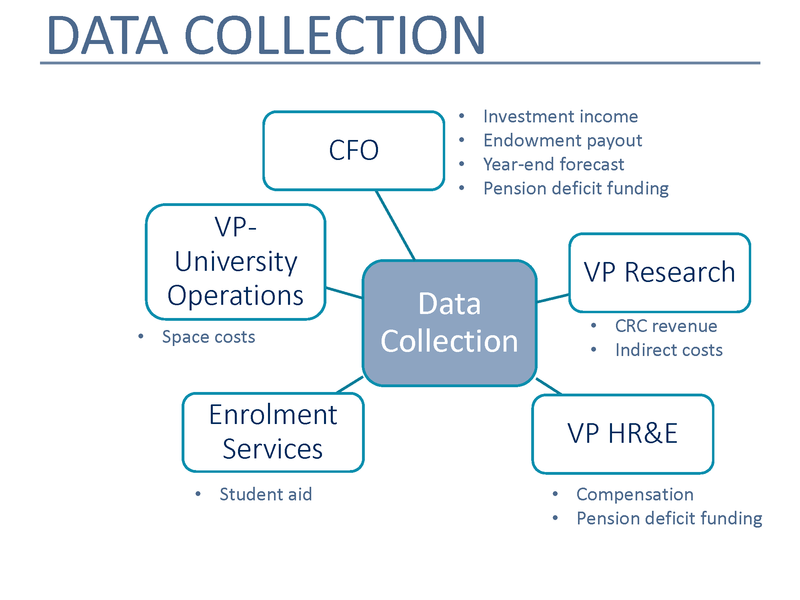 These two pie charts (Figure 1) show the University’s revenue and expenses, and some of the main categories in each. *University-wide costs (UWC) are shared costs paid by each division for services and resources such as central library, information technology, financial management, research administration, etc. Strikingly, about 70% of the expense budget is compensation – often with fixed costs and set growth rates based on collective and other agreements. There are other budgets for restricted, ancillary, and capital accounts – which you can read about each year in the annual Financial Report. Planning begins in the divisions through a bottom-up process. 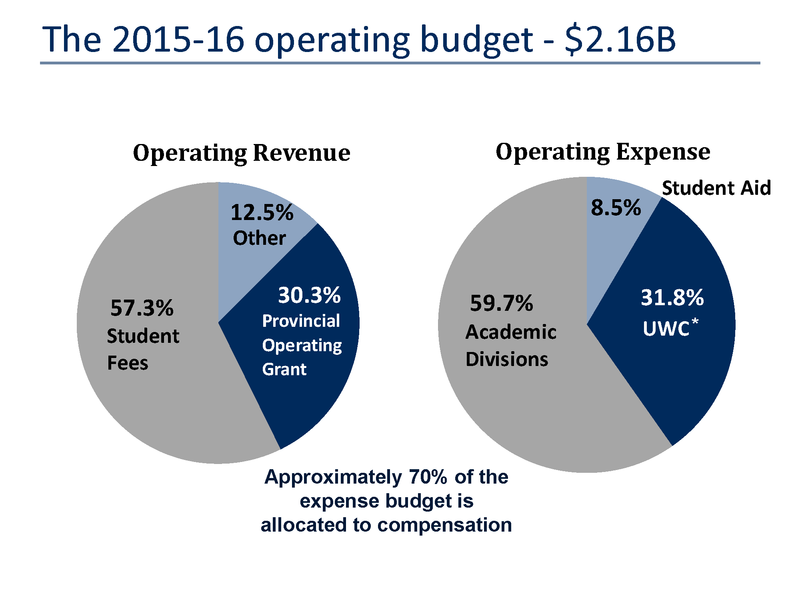 Deans and their teams in Faculties and departments, and at UTM and UTSC, look at their own revenue and expense budgets to make decisions and plans locally, based on academic priorities. Combined, all of these local decisions are rolled up for central review and approval by the administration and by governance bodies. Based on this review, the Planning and Budget Office provides budget planning templates to all academic (20) and central (10) divisions, incorporating new information and requesting divisional input on areas such as operational requirements, staffing, funding priorities, etc. Throughout the fall term, all divisions prepare a 5-year financial plan and narrative text. Even though we work on five-year plans, this exercise occurs annually to allow for any necessary updates based on the results of the scan during the summer. This allows the budget process to be nimble to change with shifting circumstances. Key date: The November 1 fall enrolment count is the annual enrolment census date that drives many decisions related to revenue and expenditure plans for future years. Deans and their staff members consult at the local level in determining and thinking through academic priorities. Following these discussions, each Dean meets with the Vice-President and Provost and the Vice-President, University Operations in what is called the Academic Budget Review (ABR) process. These meetings probe assumptions, look for areas of opportunity, and identify potential challenges for the year ahead. The second major budget process at this time of year is the “DAC” – Divisional Advisory Committee – process. This Committee is chaired by the President and is advisory to the President. It is made up of Deans from multi-department Faculties, a Dean from a single-department Faculty, and other senior academic administrators. 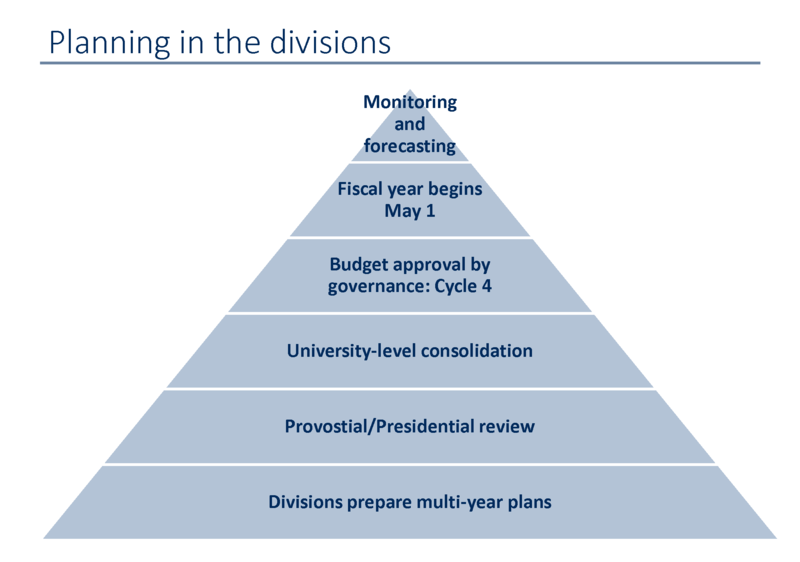 The role of this Committee is to ensure that the shared services budgets of the central divisions reflect the priorities of the academic divisions, where U of T’s mission of research and teaching takes place. The DAC process also ensures that any requests for additional resources in central administration are contained and reviewed. Institutional expenses: libraries, pension, audit, legal, etc. The winter term kicks off an active phase of the budget process – January is perhaps the busiest time for the Planning and Budget Office. The first step is data collection to inform updates to the budget assumptions in the current 5 year plan. Figures 3 and 4 indicate some key stakeholders, input, and approval items that are happening right now. *University Fund allocations are made by the Provost based on the information shared at the 20 ABR meetings. 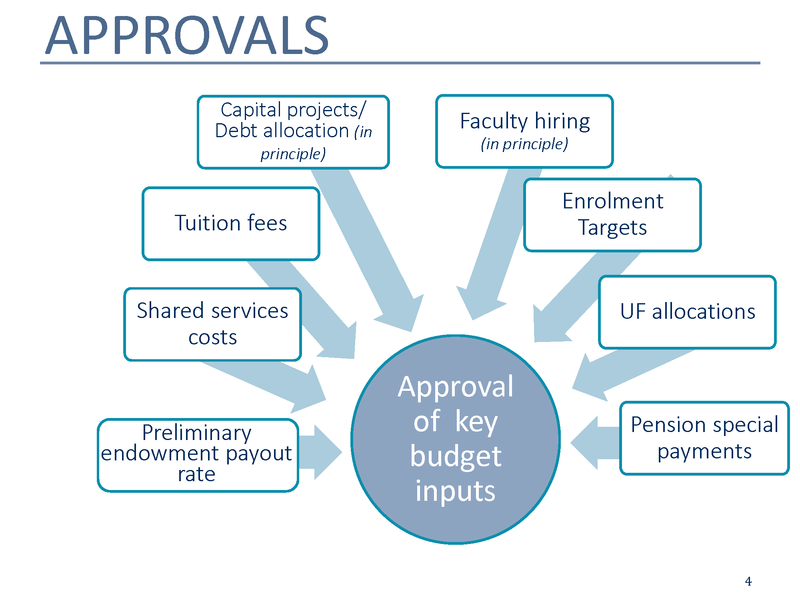 The University Fund is the primary budgetary mechanism for redistribution of operating funds. The University Fund is allocated according to the University’s multi-year academic plans and academic priorities. It is intended to maintain and strengthen academic quality and to ensure the viability and stability of academic programs, consistent with the University’s academic plans. The University Fund is set each year as 10% of (a subset of) annual incremental operating revenue. The budget report (including detailed allocations for 2016-17 and long-range budget guidelines for the five-year cycle, accompanied by tuition, enrolment, student aid, and ancillary fee reports) begins its journey through governance in cycle 4. The timeline for the 2016-17 budget is depicted in Figure 5. 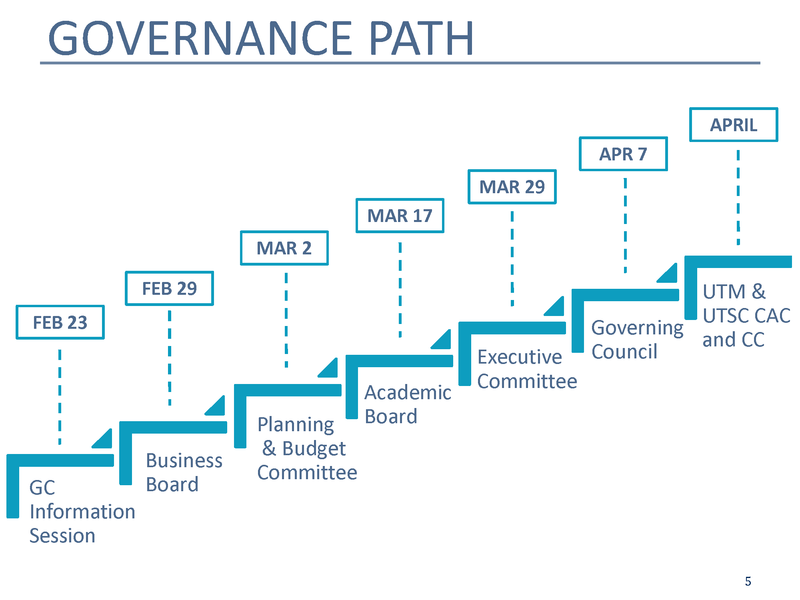 After each of the Planning and Budget Committee and Business Board governance meetings, budgets for 2016-17 are communicated to divisions – pending final approval by Governing Council – in April. Tuition fees are posted online after Business Board approval, again pending final approval by Governing Council. All of this information allows divisions and departments to prepare detailed-level budgets and upload them into the financial system during March and April. The cycle concludes as the new fiscal year starts on May 1. Detailed 2016-17 budgets are set up in the financial system as per approved budgets. In June, Business Board approves financial statements for 2015-16, including information on any revenue and expense variances in the operating budget. Resulting from this information, divisions are assigned a positive/negative year-end variance (primarily enrolment related).